The 2019 CrossFit Open is starting at the end of this month and If you haven’t seen it already our GereLu was shared by the The CrossFit Games. The general consensus is that she’s one badass masters athlete. The Open is a 5 Week competition and for the crazy few who have made their livelihood out of working out it can be a stepping stone to the CrossFit Games. We like to have fun with things so the past few years we’ve run an ‘Intramural Open’ where we turn the Open into an in-gym event that is scored based on overall team participation in the workouts. Last year we added a ‘Battle of the Sexes’ theme, which was a ton of fun and it will be returning….the Ladies are our defending champions. Each week we will be doing a ‘Friday Night Lights’ event which will be primetime for the week’s workout...we will also be offering the workouts at other times but would like to encourage people to do the Friday night session if it works for them. Sign-up through games.crossfit.com and join CrossFit Strongtown...this is $20 and you’ll have access to the games site, be able to see yourself on the worldwide leader boards, and we’ll place you on one of our in-gym teams for the Battle of the Sexes. Sign-up through PushPress...this is $10, you will not have access to the games site and will not be able to see your worldwide rankings, however you will still be placed on one of our in-gym teams for the ‘Battle of the Sexes’ and be able to do all the workouts and contribute towards the team scores. 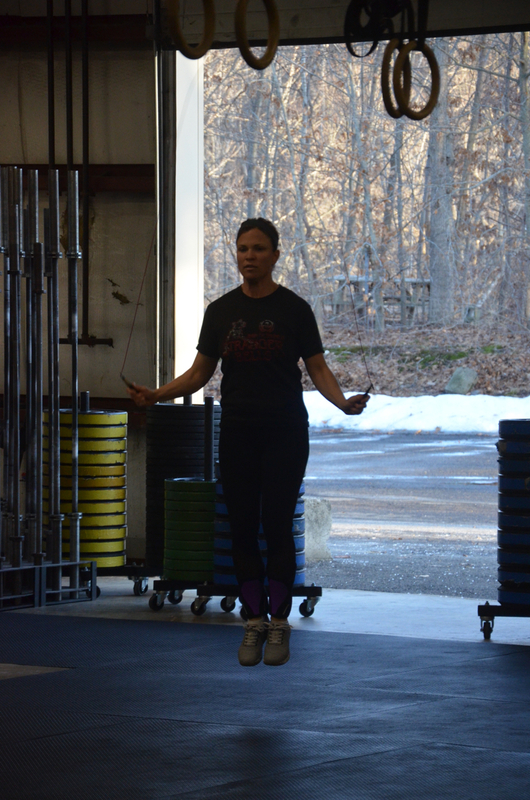 MaryBeth enjoying the almost 60 degree weather and a 2 minute double under test. I think we may have missed his official welcome post but welcome Pat to Strongtown!